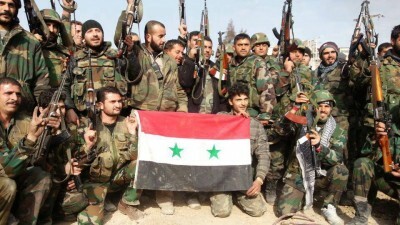 Clashes are ongoing in Damascus’ East Ghouta as the Syrian Arab Army and its allies are advancing towards the village of Nashabiyah after the liberation of Al-Bahariyah last week. On Monday, Al Nusra and its Turkmen allies launched an offensive in the Latakia province hitting SAA position at Jabal Al-Akrad and Jabal Turkmen. Pro-government forces, supported by Russian warplanes, were able to repel the advance, reportedly killing some 20 Jihadists. The SAA has recaptured the village of Tal Sawwan in the western part of Homs province from ISIS. This move indicates that pro-government forces had regrouped in the area and now, they are ready to counter attack. In turn, ISIS units can not exploit the recent advances in the province because any further movement will stretch their ways of communication, making them vulnerable for attacks. Weapons — including Kalashnikov assault rifles, mortars and rocket-propelled grenades —shipped into Jordan by the Central Intelligence Agency and Saudi Arabia intended for the so-called “Syrian moderate rebels” have been systematically stolen by Jordanian intelligence operatives and sold to arms merchants on the black market, according to a joint investigation by the New York Times and al-Jazeera. The theft, involving millions of dollars of weapons, highlights the messy, unplanned consequences of US-supported programs to arm and train rebels. There are no doubts that the stolen weapons have appeared, at least partly, in hands of Syrian Jihadi groups such Al Nusra. Turkish President Recep Tayyip Erdogan has apologized for the death of the Russian pilot who was killed when a Russian jet was downed over the Syrian-Turkish border last November. In a letter to Vladimir Putin, Erdogan expressed “his deep sympathy and condolences to the relatives of the deceased Russian pilot”, argued that Ankara never had a desire “to down an aircraft belonging to Russia” and called Russia “a friend and a strategic partner”. In addition, Erdogan said he’s ready to fight terrorism together with Moscow. A half year of the sanctions has pushed Erdogan to send a love letter to Putin. What should we wait if the sanctions remain for a year?